Joseph F. Engelberger, Ars Electronica Symposium 1996. Image courtesy of Ars Electronica. Robotics Industry Association | Joseph F. Engelberger, an engineer and entrepreneur who pioneered the robotics field, died peacefully at his home this morning, December 1, 2015, in Newtown, Connecticut. Engelberger – widely known as the “Father of Robotics” and creator of the world’s first industrial robot – revolutionized modern industrial and automotive manufacturing processes and went on to establish robotics in human services. Engelberger was 90 years old. Engelberger, an industry advocate, author, and international ambassador for robotics, founded Unimation, Inc., in 1956, the world’s first industrial robotics manufacturer. Working closely with inventor George Devol, he developed the first industrial robot in the U.S., called “Unimate”, which was installed for industrial use in a General Motors plant in 1961. Since then, approximately three million industrial robots have been installed in manufacturing facilities around the world. After selling Unimation to Westinghouse, Engelberger’s focus shifted from industrial robotics to robotics in human services. Through HelpMate Robotics, Engelberger developed HelpMate, a robot hospital courier currently used in hospitals worldwide as well as spearheading development of robotic applications to assist in care for elderly and disabled individuals. Engelberger’s industrial applications fundamentally changed the automotive manufacturing sector, introducing robotics that enabled manufacturers to achieve greater efficiency and precision with the use of robotic arms on assembly lines. The innovations Engelberger introduced were a major factor in the rise of the Japanese auto industry, where the use of robotics was enthusiastically embraced in the post-war era. Engelberger was inducted into the U.S. Manufacturers Hall of Fame in 2009. The RIA named its prestigious annual award the Joseph F. Engelberger Award in recognition of his outstanding contributions to the field of robotics. Other honors Engelberger received over the course of his career include induction into the National Academy of Engineering and the Connecticut Academy of Science and Engineering. Engelberger’s books, Robotics in Practice and Robotics in Service, are considered seminal texts on robotics and have been translated into multiple languages and distributed worldwide. 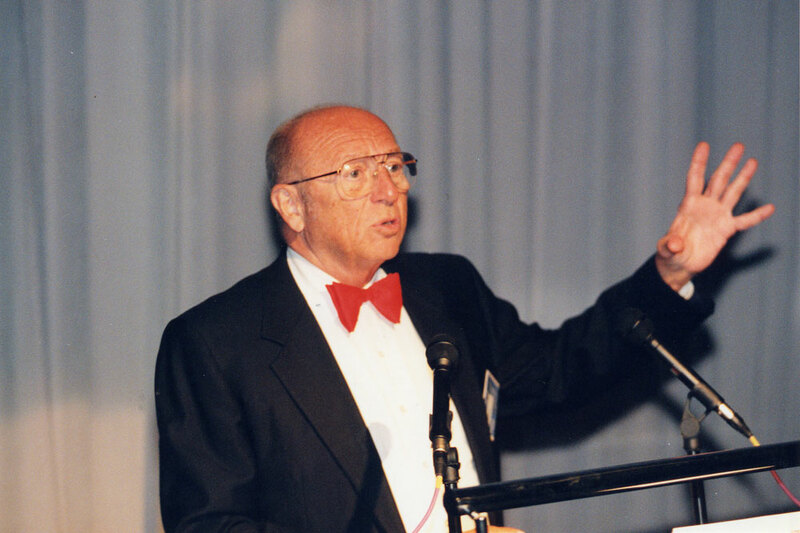 Engelberger won numerous major awards honoring his pioneering efforts in the robotics, including the Society of Manufacturing Engineers’ Progress Award, the Nyselius Award from the American Die Casting Institution, the Leonardo da Vinci Award from the American Society of Mechanical Engineers, the American Machinist Award, the Golden Omega Award at the Electrical Electronics Insulation Conference, the McKechnie Award from the University of Liverpool, the Egleston Medal from Columbia University, the Beckman Award at the LabAutomation Conference, and the Japan Prize. Profiled in the London Sunday Times as one of the “1000 Makers of the 20th Century”, Engelberger has received honorary doctorates from the University of Bridgeport, Briarwood College, Spring Garden College, Trinity College, and Carnegie Mellon University. Read RIA’s Tribute to Joseph Engelberger. Read the RIA obituary listing. Read the SVR tribute on the occasion of Engelberger’s 90th birthday. Born July 26, 1925 in Brooklyn, New York, Engelberger earned a bachelor’s degree in physics and a master’s degree in electrical engineering from Columbia University. Founded in 1974, RIA is a not-for-profit trade association dedicated to improving the regional, national and global competitiveness of the North American manufacturing and service sectors through promotion and enhancement of robotics and related automation. RIA represents over 350 robot manufacturers, system integrators, component suppliers, end users, consulting firms, research groups, and educational institutions. The association hosts a number of events including the International Collaborative Robots Workshop, the National Robot Safety Conference, the A3 Business Forum (February 3-5, 2016 in Orlando, FL) and the biennial Automate Show & Conference (April 3-6, 2017 in Chicago). RIA also provides quarterly robotics statistics and has a content-rich website, Robotics Online. For more details on RIA, visit Robotics Online or call 734/994-6088. The Association for Advancing Automation is the global advocate for the benefits of automating. A3 promotes automation technologies and ideas that transform the way business is done. A3 is the umbrella group for Robotic Industries Association (RIA), AIA – Advancing Vision + Imaging, and Motion Control and Motor Association (MCMA). RIA, AIA, and MCMA combined represent some 900 automation manufacturers, component suppliers, system integrators, end users, research groups and consulting firms from throughout the world that drive automation forward. For more information, please visit our websites: A3 – www.A3automate.org. RIA – www.robotics.org. AIA –www.visiononline.org. MCMA –www.motioncontrolonline.org.